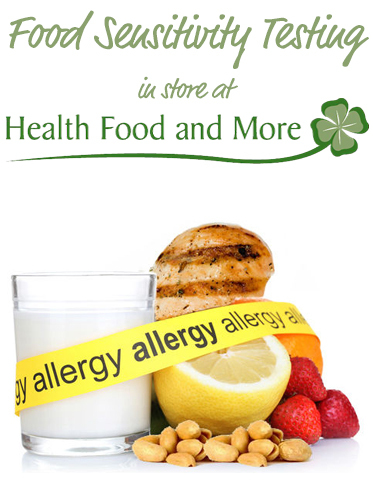 Various screening tests are available at Health Food and More for both our clinic clients and shop customers. One of the most popular services we offer is our Food Detective Intolerance Screen. This test covers 59 foods and we have results within 45 minutes. Our tester takes a small blood sample using a finger prick test much like having a diabetes check done. It’s a fairly painless procedure and over very quickly. We only need two or three drops of blood to run the test. This blood sample is run through two screening solutions and onto a dimple tray of food isolates and we watch for chemical reactions to take place with a colour change indicator. From this we can give you an idea about whether you are having a mild, medium or moderate IgG antibody response to particular foods or food groups. Following the test you will get a report with your results and be given advice about what you should try to do to address any issues you may have. You might wish to make sensible dietary adjustments and we may suggest supplements such as probiotics or enzyme therapy if indicated by your results. Testing under two years of age is not recommended and if you are on immunosuppressive treatment this may impact your results. In addition you need to be consuming suspect foods for at least a week before any testing is carried out. Costs £60 and an appointment needs to be pre-booked as this is a popular test.